When we work on a bathroom remodel, we always have two goals in mind. Of course, we want to create a space that looks beautiful. But perhaps more importantly, we want to create a space that meets all of our clients’ needs. When we work with clients who have purchased a home that was designed with someone else’s needs in mind, we face the challenge of adapting a space to fit a new set of needs and wants. 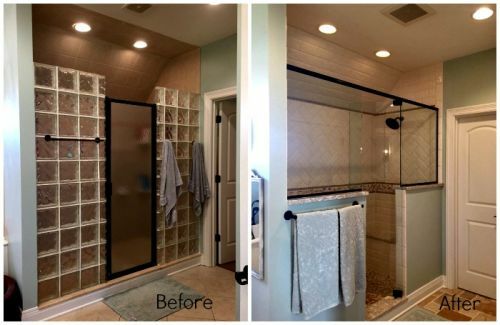 That is just the situation that we faced with this recent bathroom before and after remodel. One of the challenges we faced in this master bath project was size and proportion. The previous resident of this home was a basketball player, so the granite counter top had been bumped up over six inches to accommodate his height. This accommodation was not so convenient for the current residents! To update the vanity space, we brought things back down to a normal height and installed light Cambria Berwyn countertop that has a touch of sparkle. We also decided to move away from the heaviness of dark wood, and instead lightened things up with these cream cabinets from 5 Pines Cabinetry. We built in the mirrors, tower, and lights and feet to make the unit feel more like one piece of elegant furniture. The finished product is stylish, serene, and much more functional for the homeowners. We also made some big changes to the bath tub area. The original tub was very large, and took up a lot of space in the room. We went in a completely different direction by putting a claw foot tub in this space. We coordinated the bronze faucet with the existing light fixtures to tie the space together. It’s now a charming spot to soak and relax! Our goal with the shower was to create something more modern. The original shower had a very dated glass block design, which we updated to clear frameless glass. Inside the shower, we added two storage niches and some gorgeous tile work. The original shower had two shower heads, so we converted one into a hand shower. This makes cleaning the shower (or cleaning the kids!) easier. On the floor, we used natural stone mosaics. Finally, on the bathroom floor we used a natural chiseled marble, placed in a Versailles pattern. The finished result is elegant and understated. 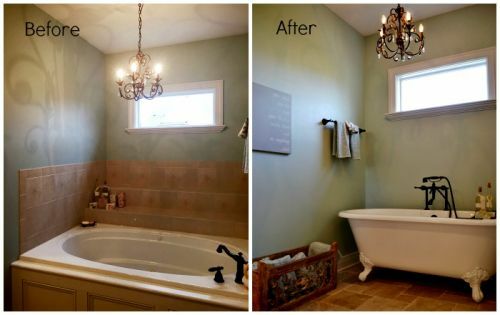 When you put the “before” next to the “after,” it’s easy to see the aesthetic improvements to the room. However, we’re most happy that we were able to create a space that is both beautiful and usable for the homeowner. What’s the fun in a beautiful bathroom if you can’t enjoy it? 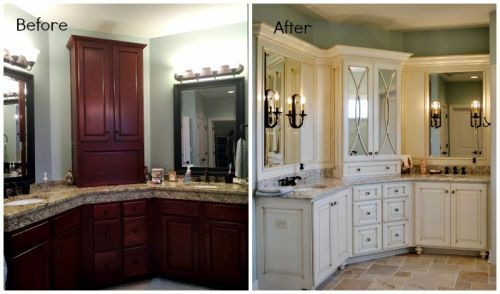 If you have a bathroom or kitchen that needs an update to work well for your family, we’d love to show you how we can combine beauty and function. Stop by our showroom to learn more about how we can transform your home. We’re offering 0% financing for 24 months through May 31st, so now is the perfect time to start a project. Improve your space now so you can enjoy your home all summer long!